Would you fire Steve Ballmer? A US federal appeals court upheld a $290-million judgment against Microsoft Corp. and ordered it to stop selling MS Word unless it removed code that violated the software patent of an obscure Canadian company, i4i, that sued it in Texas and won. The ruling is ironic, given Microsoft’s use of software patents earlier this year to bludgeon TomTom, a Dutch maker of car navigation systems, into settling over its use of the Linux kernel. Ballmer has bellicosely proclaimed that the kernel violates several Microsoft’s patents and has threatened to sue developers and users alike over its use. The company’s suit against TomTom in February was the first time it tried to enforce these patents against the Linux platform. 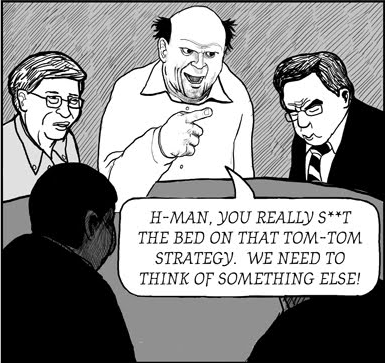 The author focuses on the TomTom case but misses the more important point about Microsoft using racketeering tactics, which ought to send people like Steve Ballmer to prison (and bring Bill Gates back to court for crimes that he too had helped commit and initiate). Speaking of Stallman’s contribution to saner law, where are OIN, Linux Foundation and other IBM fronts when it comes to just abolishing software patents? They have other strategies in mind. The FSF and FFII seem to be among very few who are actively committed to the cause. The EFF’s squashing strategy and Peer2Patent’s gardening or voluntary peer review process are still considered somewhat controversial. Here is a new article from The Register that in some way legitimises software patents for the same reason; by labeling them “good” and “bad” (mostly bad) it tacitly claims that some of these patents are acceptable. OIN very explicitly takes this point of view, whereas for Peer2Patent it is still just implicit. El Reg is always eager to lap up the sad, eerie, and unusual of the bunch as they fall into our sights. We’ve gathered up a few of our 2009 favorites published in honor of the year’s end.